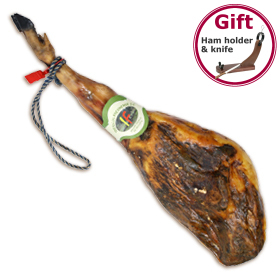 40% DISCOUNT on Pata Negra HAMS Ibericos Frexnense - Until Wednesday 29th only! We know that some of our customers were late to take advantage of our offer in January, so we are now offering an unrepeatable price on one of the best hams on sale on IberGour. These are large hams, approximately 8 kg, cured for four years in natural ageing "bodegas" in the south of Extremadura. Offer price: 288 € | £244 VAT incl. Delivered within 5-7 working days. Express shipping available.